Square Enix has shared their financial results for the fiscal year ended March 31st, 2018. With a chart of the digital entertainment segment, we are provided a look at how well the company performed and what the company has planned for the future. The chart above compares the company’s net sales and operating income for the fiscal year ended March 2018 to the previous four years. 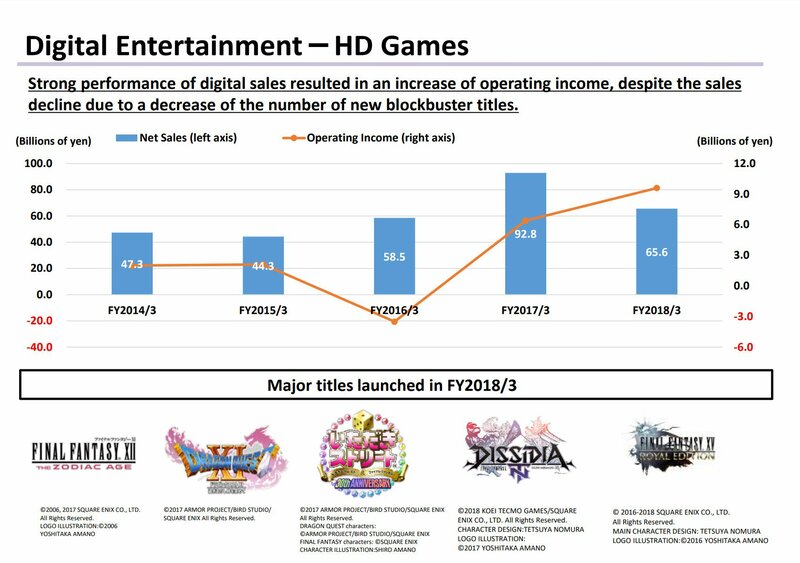 And while net sales declined because of a decrease in the number of new blockbuster titles compared to fiscal year 2017, Square Enix saw a strong performance in digital sales that resulted in an increase of operating income. The major titles that were released in the fiscal year ended March 31, 2018, were Final Fantasy XII: The Zodiac Age, Dragon Quest XI, Fortune Street & Final Fantasy 30th Anniversary, Dissidia Final Fantasy NT and Final Fantasy XV Royal Edition. 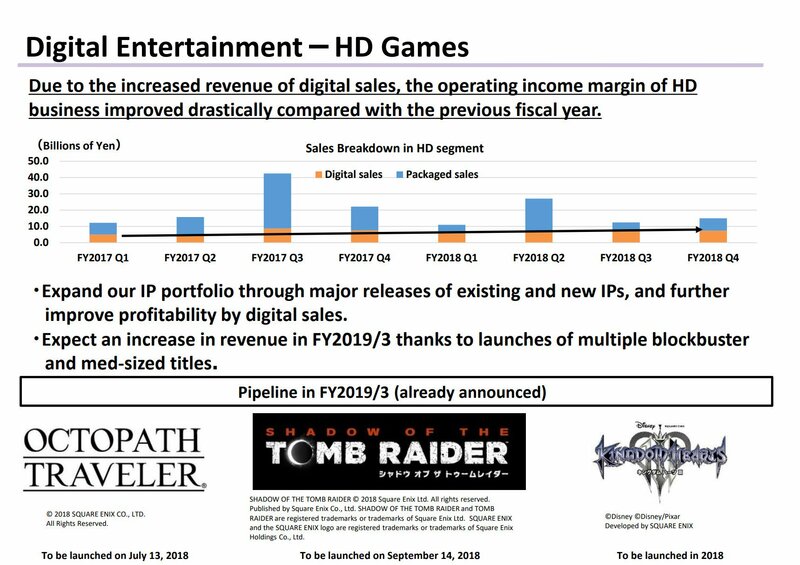 The second chart showcases that, because of the increased revenue of digital sales, the operating income margin of HD business improved greatly compared to the previous fiscal year. Expand our IP portfolio through major releases of existing and new IPs, and further improve profitability by digital sales. Expect an increase in revenue in FY2019/3 thanks to the launches of multiple blockbuster and mid-sized titles. Located on the bottom of the chart is the already announced titles scheduled to release in FY2019, which include: Octopath Traveler which is set to release July 13th 2018, Shadow of the Tomb Raider on September 14th 2018 and the long awaited Kingdom Hearts III, which is still scheduled for a 2018 release. What on earth are ‘mid-sized’ titles? Does that also mean that there are also ‘low-sized’ titles? Final Fantasy All the Bravest maybe? ‘Mid-sized’ (or ‘mid-shelf’) is basically anything that isn’t full-on AAA, but still comes with a noticeably higher budget than an ‘indie’ game. Games like Octopath Traveler and SaGa Scarlet Grace would fall under this label. KH3, DQ11, FF7R, and MAYBE Tomb Raider 3. ‘Maybe’ tomb raider 3?? That’s already announced for September this year? And are you clumping FF7R in the same cluster of games?? WHERE in that do you SEE FF7R, WHERE do you see a “maybe” on TR3!? I’m just naming what I’m interested in. If their blockbuster isn’t any of those I don’t wanna hear about it. I’m saying no matter what their blockbusters or E3 stuff will be, all i want to hear about are the ones I named. I know some people will hate me but I hope that Kh3 isn’t coming till March 2019. I don’t think that the game is ready. Tetsuya also statet a while ago that they want to announce every world and if a world isn’t finished then they could release it as Dlc. As longs as we’re not paying for that DLC and it’s not pertinent to the story then I don’t mind this method. I understand your thinking and I mostly agree but at this point I’m worried that if they wait too long the hype will die down and they won’t sell as many copies. If that happens there might not be enough of a budget to release anything extra or incentive for future kh games. Yeah. From an ecomical standpoint It would makes sense to release the game by the end of this year because KH3 is a game that could sell far more copies on christmas then on other times, because many people who dont know anything about the franchise think that this is a kids game. It makes sense for them to release it this year, the fans will buy it and many Disney fans and kids will get this game. For me it would just be sad if the game releases unfinished, because I am waiting since the e3 announcement and I also can wait much longer than that. I can also undersrtand that many people are tired of waiting but I also thing that it wouldn`t mind if we wait 3-5 more months.